The key to using rechargeable batteries in a heavily electronic household is to a) hide the non-rechargeables, and b) have lots of rechargeables already charged and handy. The problem we had in the past was not having enough rechargables in stock and charged, which meant we had to have a cache of regular batteries, which meant we tended to reach for those first, defeating our efficiency intentions. Now we have a decent stockpile of charged rechargeables and no reason to dip into the outmoded stuff. You want to have an inventory of about 1.5x the number of batteries in active use, so you always have a stockpile of ones already charged. You are probably using more than you think. 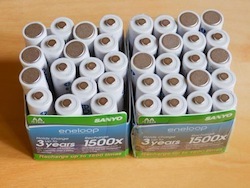 Eneloop rechargeable batteries, which we have reviewed twice before, come somewhat charged in the box, recharge fast, and can be acquired in bulk packages of 20.